Winner of the 2019 Audio Award for Best Middle Grade Audiobook! 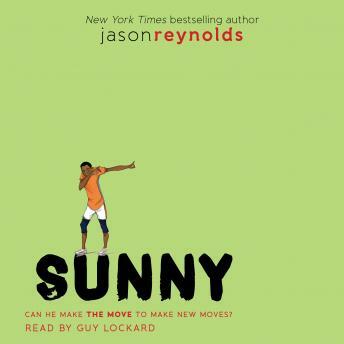 Sunny tries to shine despite his troubled past in this third novel in the critically acclaimed Track series from National Book Award finalist Jason Reynolds. Ghost. Patina. Sunny. Lu. Four kids from wildly different backgrounds, with personalities that are explosive when they clash. But they are also four kids chosen for an elite middle school track team—a team that could qualify them for the Junior Olympics. They all have a lot of lose, but they all have a lot to prove, not only to each other, but to themselves. Sunny is the main character in this novel, the third of four books in Jason Reynold’s electrifying middle grade series. Sunny is just that—sunny. Always ready with a goofy smile and something nice to say, Sunny is the chillest dude on the Defenders team. But Sunny’s life hasn’t always been sun beamy-bright. You see, Sunny is a murderer. Or at least he thinks of himself that way. His mother died giving birth to him, and based on how Sunny’s dad treats him—ignoring him, making Sunny call him Darryl, never “Dad”—it’s no wonder Sunny thinks he’s to blame. It seems the only thing Sunny can do right in his dad’s eyes is win first place ribbons running the mile, just like his mom did. But Sunny doesn’t like running, never has. So he stops. Right in the middle of a race. With his relationship with his dad now worse than ever, the last thing Sunny wants to do is leave the other newbies—his only friends—behind. But you can’t be on a track team and not run. So Coach asks Sunny what he wants to do. Sunny’s answer? Dance. Yes, dance. But you also can’t be on a track team and dance. Then, in a stroke of genius only Jason Reynolds can conceive, Sunny discovers a track event that encompasses the hard hits of hip-hop, the precision of ballet, and the showmanship of dance as a whole: the discus throw. As Sunny practices the discus, learning when to let go at just the right time, he’ll let go of everything that’s been eating him up inside, perhaps just in time.